Katsudon spread with buckwheat noodle in Japan! Katsudon is a Japanese traditional donburi dish which consists a bowl of rice tooped with tonkatsu, egg and onion. Tonkatsu is a dish of deep fried pork cutlet. Katsudon's "katsu" means a cutlet, "don" means a donburi which is a rice bowl. Katsudon is an abbreviation for Tonkatsu-don, but it is popularly called by Katsudon. 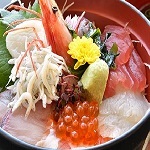 It is ranked the top five in the Japanese favorite donburi dish ranking. Katsudon is also known for a dish during interrogation in Japan. That spread by police drama in the past. However, that is prohibited because of a constrained confession now. It has became a gag of police drama and comedy. Katsudon is also known for good luck food beause "katsu" means win. Many test takers and young athletes eat it before the examination and big game. In general, Japanese people cook Tonkatsu by frying a pork in salad oil after coating with wheat flour, stirred egg and water. They simmer it with eggs and onions in sauce made from dashi, sake, mirin, sugar and soy sauce for several minutes. They complete it by putting it on top of rice. 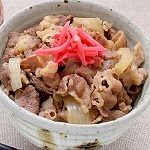 Many seasonings are need to cook it, they often use Hontsuyu, Mentsuyu or Konbutsuyu sauce sold by Yamaki or Kikkoman to cook it faster or without dashi, soysauce, sake and mirin. It is possible to easily complete a Katsudon sauce by diluting these sauce with water. These sauce are sold not only in many grocery stores in Japan but also in Amazon USA. Hontsuyu and Mentsuyu is called Japanese Noodle soup base in Amazon USA. A deep fried meat called cutlet in Japan was introduced to Japan from foreign countries in the begining of Meiji period(1868-1912). Beef cutlet and chicken cutlet were major at first. in 1895. Motojiro Kida who was the owner of restaurant named Rengatei in Ginza served the first deep fried pork cutlet in Japan. This restaurant is still opening, and is also known as the first restaurant to serve not only pork cutlet but also fried oysters and Omu-rice. The name of "Tonkatsu" spread after Shinjiro Shimada who was the owner of Tonkatsu restaurant named Tonkatsu Ponta in Ueno called a pork cutlet "Tonkatsu". In addition, there are several theories about the origin of Katsudon. One of them is that the first owner of restaurant named Europe-ken in Fukui prefecture served Katsudon in 1913. The other theory is that the chef of restaurant named Sanchoan in Tokyo served it when he cooked it to warm over left over cutlet in 1919. 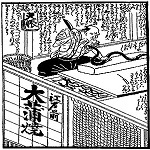 The more major theory is that Buckwheat noodle restaurants named Okumura in Yamanashi prefecture served it around 1902. Buckwheat noodle restaurants called Soba restaurant or Sobaya in Japan supported spreading Katsudon all over Japan. Buckwheat noodle has been popular among Japanese like pasta among Europe. Street stalls serving it opened in the begining of the Edo period(1603-1868). They served not only buckwheat noodle but also tempura which was Japanese deep fried shrimp, fish and vegetables. They could serve tempura easily because Soba's soup was made from dashi, and tempura was eaten with dipping dashi sauce. They could also serve Katsudon in a similar way. By the way, some restaurants serve a Katsudon made from beef or chicken instead of pork. Beef Katsudon is called "Ushi-katsudon" or "Gyu-katsudon", Chicken Katsudon is called "Chicken-Katsudon" or "Oyako-Katsudon" in Japan. In addition, there are various Katsudon without egg, Sauce-Katsudon, Domi-Katsudon, Miso-Katsudon, Waraji-Katsudon and more. Sauce-Katsudon is seasoned with worcester sauce instead of dashi and egg. Domi-Katsudon is seasoned with demi-glace sauce instead of them. Miso-Katsudon is seasoned with miso(bean paste) sauce instead of them. Waraji-Katsudon has more big two cutlet than Katsudon, and seasoned with salted and sweetened sauce. 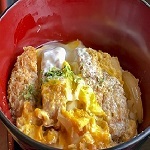 There are many Japanese restaurants serving Katsudon in Japan, Soba restaurants, Gyudon and Katsudon restaurant chain. Katsuya is most popular Katsudon restaurant chain in Japan. It opens their restaurants all over Japan. When you travel Japan, it might to be a good idea to eat Katsudon. You can experience Japanese culture through it. If you can not eat it in Japan, you can cook it easily with buying Hontsuyu, Mentsuyu or Konbutsuyu sauce.